Configuring the whole network is not always desirable, because some part of the network should rather be configured dynamically. In this step, some wired and wireless LANs’ addresses are left unspecified by the configurator, and they get addresses with DHCP. This step uses the ConfiguratorC network, defined in ConfiguratorC.ned. description = "Leaving some part of the network unconfigured"
# TODO: should it be  or [*] ? Similarly to Step 8B, members of the two wireless LANs are specified by SSID. Area1lan3host2 is configured to ping area3lan3host3. The ping application is delayed, so it starts sending pings after the hosts associated with the access points and got their addresses from the DHCP servers. DhcpServer submodules are added to the area routers. The DHCP server is configured to listen on the interface connecting to the unspecified LAN. The interface’s netmask is the DHCP server’s address range. DhcpClient submodules are added to the LANs which are unspecified by the configurator. There is one such LAN in each area, they are area1lan3, area2lan1 and area3lan3. Hosts in these LANs get the addresses from the DHCP server in the corresponding area router. Routes to area3lan3host3 are visualized. Addresses are assigned hierarchically. Five LANs in the network have addresses assigned by the configurator. Three LANs get their addresses from DHCP servers, their interfaces are left unspecified by the configurator. This is accomplished by the lack of address assignment rules for these hosts in the XML configuration. The area routers’ interfaces connecting to the latter LANs need to be specified in order to have correct routes to these LANs. Additionally, the addresses for these interfaces need to be assigned specifically, and they have to fall in the configured DHCP server address ranges. The hosts of area1lan3, area2lan1 and area3lan3 have unspecified addresses. The routing tables of all hosts contain subnet routes to these three LANs. 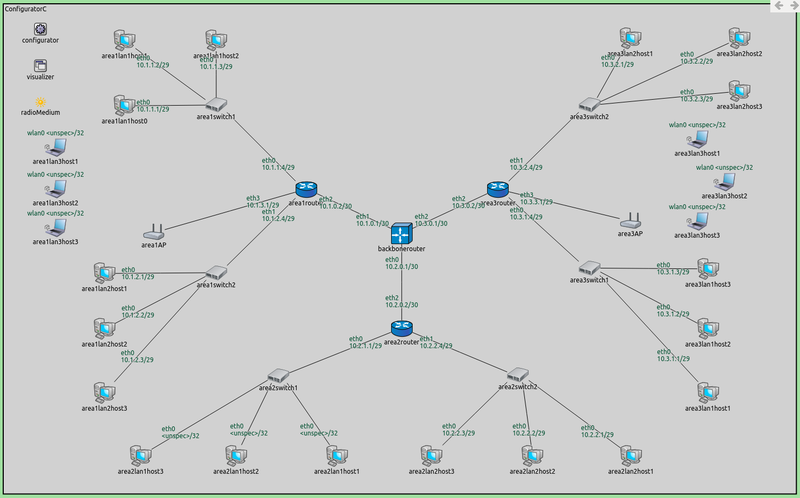 Since these hosts don’t have addresses at the start of the simulation, there are no routes leading to area3lan3host2 that can be visualized. Though the hosts in the three LANs have unspecified addresses, subnet routes leading to these LANs are added to the routing tables of all hosts. The addresses for the interfaces connecting to these LANs have a netmask assigned so there are addresses allocated for the unspecified hosts. For example, area1router’s eth3 interface has the address 10.1.4.1/29, and has four addresses allocated (10.1.4.2..5). area1lan3host2 has a default route for reaching the other hosts in the LAN. 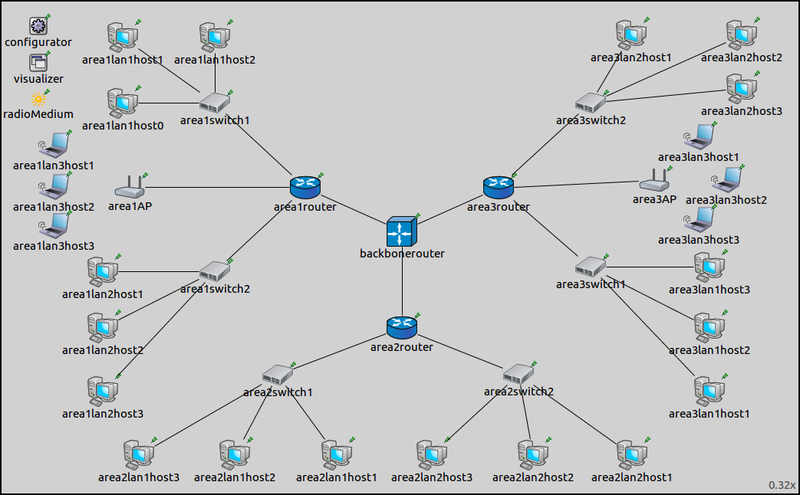 area1Router has a route for reaching hosts in area1lan3, and a default route for reaching area 2 and area 3.
backbonerouter has subnet routes to each area. No routes are visualized initially, because area3lan3host2 (the destination of route visualization) has an unspecified IP address. When it gets an address from the DHCP server, the routes leading towards area3lan3host2 appear.